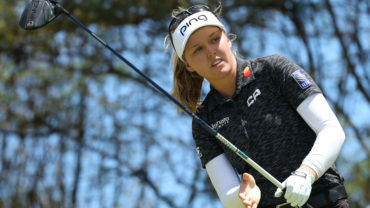 NAPLES, Fla. – Sung Hyun Park was in the palmetto bushes, near the base of the tree, in the bunkers and going nowhere in the CME Group Tour Championship. What looked to be a victory lap for the 24-year-old rookie from South Korea turned into a free-for-all Saturday at Tiburon Golf Club. Park at least was in solid position, one shot out of the lead, in her bid to become the first rookie since Nancy Lopez in 1978 to sweep all the major LPGA Tour awards. She just never expected so much company. 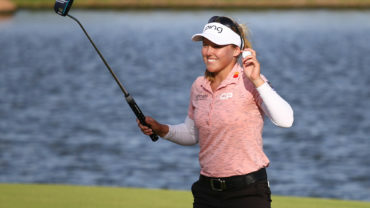 Michelle Wie, who lost six weeks to an emergency appendectomy, had a 6-under 66 and was part of a four-way tie for the lead going into the final round. Kim Kaufman, who is recovering from mono, ran off eight birdies in her round of 64. Joining them at 10-under 206 were Ariya Jutanugarn (67) and Suzann Pettersen (69). 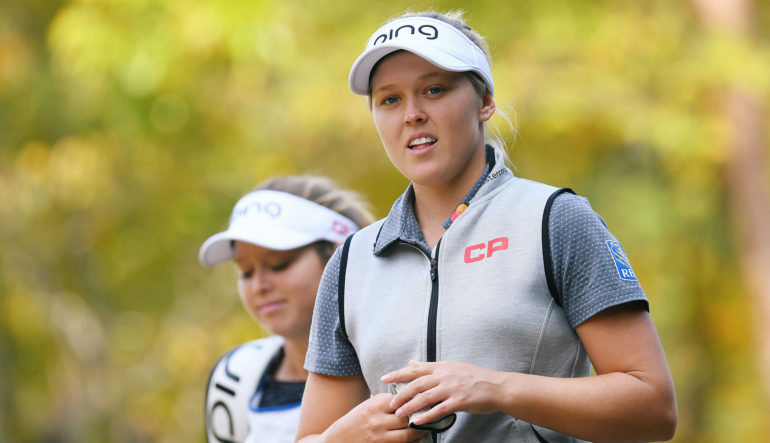 Brooke Henderson (70) of Smiths Falls, Ont., was tied for 23rd at 6-under par. Hamilton’s Alena Sharp (69) was tied for 54th at 2 over. Park, who didn’t make a birdie until the 13th hole and shot 75, was among seven players one shot behind. Now she can only hope her one bad day is behind her. Lexi Thompson, who leads the CME Race to the Globe, suddenly has just as good of a chance as Park to capture the $1 million bonus. Thompson also is poised to win the Vare Trophy for the lowest adjusted scoring average. 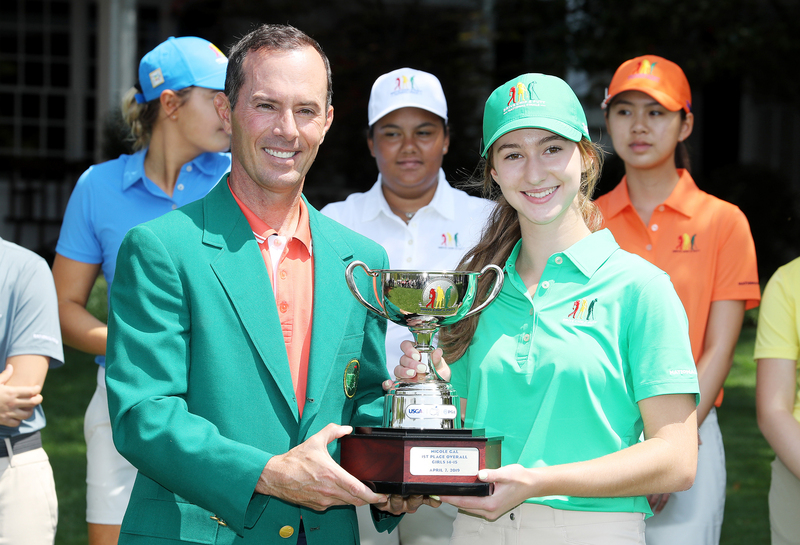 Park needed to finish 10 shots ahead of Thompson – she started Saturday six shots ahead – to win the Vare Trophy. The final day is so wide open that 31 players were separated by four shots. That includes Shanshan Feng, in her debut at No. 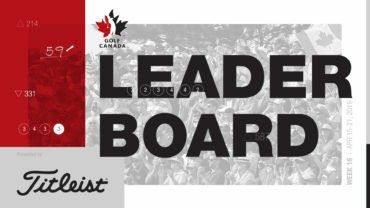 1 in the world, and Brooke Henderson of Canada. They only have to win the Tour Championship to claim the CME Race to the Globe. And they all have Park to thank for every having a chance. Kaufman showed early that low scores were available in her round of eight birdies. Park showed early that it was going to be a grind when she missed the green to the left on No. 2 and pitched far too strong up the slope, leading to bogey. Then, she hit into palmetto bushes on the par-5 sixth and made double bogey, and the game was on. Park looked as though she had steadied herself with an 8-foot birdie on No. 13 and scrambling for birdie after a poor drive in the waste area right of the 14th. But she took bogey from the bunker on the par-3 16th to fall back into a share of the lead, and then drove well left on the par-5 17th next to a tree. She chipped into a sandy waste area, came up short into a bunker and failed to get up-and-down. Stacy Lewis (67), who ended a three-year victory drought two months ago, shot a 67 and was in the group at 9-under 207 that included Thompson (69), Park, Karine Icher (68) and Austin Ernst, whose 69 featured a quadruple-bogey 8 and an eagle-birdie finish on the back nine. At stake on Sunday is just about everything. So Yeon Ryu, who was only five shots behind but had 31 players ahead of her on the leaderboard, still had an outside chance at holding on to her lead for LPGA player of the year if Feng, Park and Thompson failed to finish near the top of the leaderboard. Thompson suddenly looks good for the Vare, while Park remained in good shape to capture the money title. Jutanugarn, who won five times last year, is No. 9 in the CME Race to the Globe. She could win the $1 million bonus by winning the tournament and have Thompson finish out of the top nine. Instead of a sprint to the finish, so many players have a chance that it still feels like a long way off.